As pears, pumpkins and late-fall apples find their way into cozy soups and rich desserts at this time of year, it can be easy to overlook another fruit harvested from the end of October through November – the olive. But no one forgets olive season at Extra Virgin, an Olive Ovation in Clayton, an artisan boutique specializing in the olive’s many forms, from oils and spreads to soaps and lotions. Each fall, owner Marianne Prey adds another item to her inventory: a limited supply of fresh, raw arbequina olives, handpicked from the same small, family-owned northern California olive grove that supplies the fruit for Extra Virgin’s private-label oil. As long as the supply lasts, customers can buy raw olives at Extra Virgin by the pound to take home for brining. Last year, Brasserie by Niche executive chef Adam Altnether bought 150 pounds of raw arbequinas from Prey to brine in-house and use in various dishes at the Niche restaurants. But don’t think that brining olives is just for culinary school grads. With Prey’s tips, any home cook with the inclination can brine their own olives. Olives must be cured to remove a bitter compound called oleuropein, which needs to be drawn out before the olive is edible. They can be dry-cured by packing the olives in sea salt, but Prey recommended a wet cure for the arbequinas because salt-curing would dry out these small olives too much, leaving little to no meat. Simply soak the olives in water for weeks to months, depending on their size or level of ripeness; the more frequently you change the water, the faster the oleuropein will be drawn out of the olives. Prey suggested tasting the raw fruit at the start of the curing as a starting point for measuring bitterness, and then sample every few days to follow the flavor progression. The olives can be soaked to a point where they are completely bland with a natural sweetness or until the level of bitterness appeals to your palate. Once the bitterness is to your liking, finish the olives in a salt water and vinegar brine. To ensure the right proportions of salt to water, Prey recommended placing a raw egg in a bowl, filling the bowl with water and adding noniodized salt. When the egg starts to float, the proportions are right. At this stage, too, the length of time the olives sit in the brine is dependent on personal taste and the size of the olive. Once the olives reach your desired level of saltiness, they’re ready to be used in marinated olive mixes like those at Niche and Robust Wine Bar, tapanades and salads. The finished olives should be stored in fresh brining liquid. At this point, consider introducing different flavor profiles to the brined fruit. 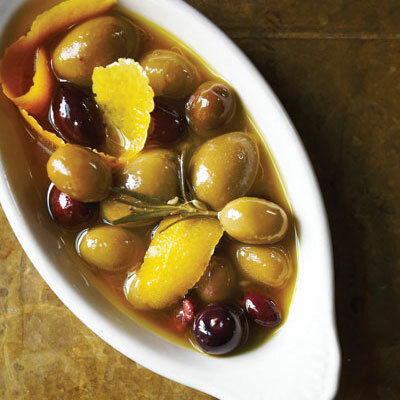 Adding citrus peel, fennel or Italian herbs – or hot pepper and cinnamon for Moroccan-style olives – to the brining liquid will infuse the olives with flavor.